Geographic Map of Area between Diespeck and Nürnberg. It is from this area that Johann Peter Hasselbacher and his wife Eva Maria Gundaker emmigrated to Illinois in 1857. Many modern Hasselbacher descendants came from this area as well. Peter was born and schooled in Gunzendorf. This area was populated early by Hasselbachers. Just as one of the sons of Paulus the elder sent progeny to Stübach and Diespeck, so did son Adam, who was born 1698 in Oberroßbach, settle in Wilhelmsdorf and Gunzendorf. Offspring from this branch of the family lived in Emskirchen, Herzogaurach, Puschendorf, Langenzenn, and Fürth. See the Political Map of this area elsewhere in this map section. 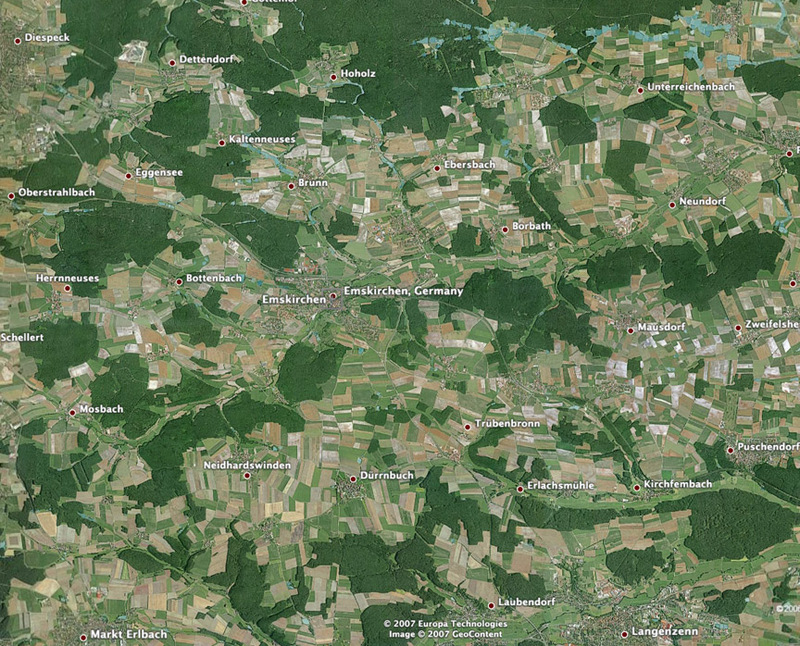 The villages of Wilhelmsdorf and Gunzendorf are not labeled on this map. They are the nearest villages to the north-east of Emskirchen. Their locations are labeled on the Political Map.